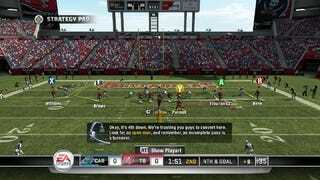 Last year, Madden introduced cooperative two-man multiplayer. This year, the gang at EA Sports Tiburon beefed that up to a three-on-three and blended in some features to draw out teamwork and communication among teammates. On offense, the available positions are quarterback, running backs and receivers (including tight ends). Selecting the latter two groups allows you to cycle among all available players of that type. Playing as the quarterback puts you in charge of the playcalling and audibles. It's also possible to have multiple players at receiver or running back and leave the CPU in charge of the QB if you like. But the choice you make at the beginning of the game is yours throughout it, so consider that carefully. In my game, I played as receivers and tight ends. You're given a route arrow to follow throughout the lifespan of the play, and my control was grooved enough that I didn't deviate from it much, as I have seen in previous versions where my receiver or defensive back have felt like they were rollerskating the pass routes. My first play from scrimmage, with Marques Colston, I caught a slant pass from Drew Brees, got outside the pursuit angle, and housed it for about a 60-yard touchdown, against live competition. Very satisfying. You have to pay attention as the receivers, though, and communicate with your quarterback. On one play I switched off to the red-route primary receiver after he audibled a fly pattern for my player, resulting in a pick. The display will toggle between your gamertag and the real player's name when you switch, and he's of course highlighted in red, but if you're playing too casually you can lose track of who you are. If your buddy completes a pass to a bot receiver, you can instantly switch over to him and control him to the end of his run. If you are playing as receivers with a bot QB, you can also call for the ball if you get open and have it delivered. We didn't do this, but paired up with another human receiver, you can go completely off message with your routes and run it sandlot-style, risking the pick or a sack of course, but it's there. On defense, you will be asked to choose from the defensive line and linebackers, or the defensive backs. The line/linebackers guy will be in charge of the playcalling. Here I got a good taste of the new Gameflow engine, which sends in a situation-specific play and advises you what to look for. Again, your defensive assignments are mapped on the field throughout the play, so if you're told to go into man coverage on the running back he'll be pointed out all the time. Again, you can switch among anyone in your grouping at any time. Another feature you'll want to take advantage of is the defensive assist (introduced last year). Holding the A (or X) button puts your guy into his correct motion or zone, or gets him following the play if you've strayed or become disoriented. I'm a spaz, even as a linebacker trying to hit the gap. Defensive assist got me where I was supposed to be and helped me finish off the quarterback with a crunching sack. Madden's devs know how many find playing defense hard to grasp and somewhat tedious; defensive assist is there for them, and online team play makes its utility more apparent. You'll also notice a different camera perspective in this mode. On defense, you'll be driving up the screen rather than down it - a decision Tiburon reached after some consideration. The hit stick is therefore inverted - thrash up on the right analog to deliver a crunching tackle, not down. The cooperative multiplayer camera is also angled back some to give a wider view of the field. I hadn't, for example, really noticed how far away from the stands the New Orleans sidelines were until seeing them here. Bear in mind that the team that truly plays together has a no-cost advantage in the game. Use a headset. Call out what you see across the line on offense and defense. Coordinate your receivers and hot routes. It's simple enough to say, but this is how a team wins at football, and the mode is deliberately built to reward that. Finally, during the games you will accrue experience that translates to perks, not unlike such systems seen in shooters like Call of Duty. Your quarterback will be more accurate, your running back will get bonuses to speed, etc. These perks are persistent throughout cooperative multiplayer regardless of who you're paired with, and players with a lot of experience will be desirable teammates. I don't expect this to overtake traditional one-on-one multiplayer games as the preferred online mode of Madden. But I don't imagine it will be a gimmick either. I'm a strong advocate of cooperative play in online sports, which is less intimidating than the quickmatch survival of the fittest without being a completely nannying experience. Being the only game in town, nearly every addition to Madden is met with skepticism and this should face fair scrutiny as people spend more time with it. But EA Sports knows that many people log into this game's multiplayer once and never return, and they're trying to provide alternatives that will change that.